How do you create a table where 1 of 2 foreign secrets are needed? I am developing a table of ownerships for files. Personal files could be possessed by whether single user (table Customers) or several customers (table UserGroups). I must get this to whole relationship as you table, where each tuple will be an group's possession or perhaps a user's possession of the file. I believe you can do both associations as you table, but I am not quite sure how. It's also acceptable if Customers or UserGroups tables have to change (still within the planning stage). 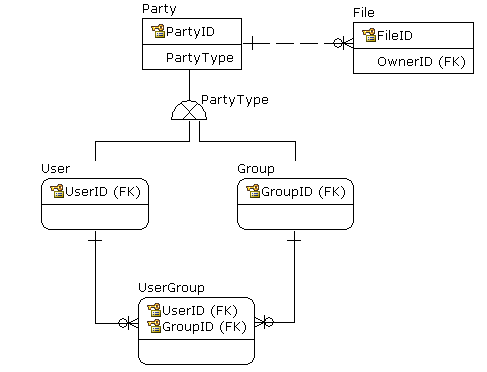 OwnerID = PartyID (OwnerId is really a role title of PartyID within the File table). Possess a table with (File,OwnerID,GroupID) in which a touple which has OwnerID populated joins towards the user table along with a tuple with GroupID populated joins towards the Groups table. Style of the recommendations engine database? How do you alter the python_egg_cache? Which is faster rewrite or folder based Web addresses? How do i separate "Data" from the console application? What's the distinction between ODBC and OleDB?